A Medi Kingdom cannabis field in Lesotho. Ahhh the negative nellies begin their projected lament. How are the Cartels Who have ran this Cannibus Biz for so long Reacting to All this legalization and commercializing hemp? Two pounds does not a market make however, someone smarter than me coined the phrase ‘great storms announce themselves with a simple breeze’ … so I strongly suspect there will always be craft influencers tied to public or private perceptions that will allow for pricing and supply anomalies in what will eventually become a commodity and medical tethered element. All these guys that think they’ll get rich growing pot inside a warehouse are going to loose their shirts. 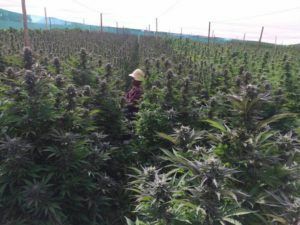 Marijuana will be grown on farms out doors in tropical climates, there is no way an indoor operation will be able to compete once outdoor farming gets ramped up.